Do you want to be up to date on the latest concepts of diagnosis and treatment of patients suffering from disorders of the pituitary gland? Are you looking for an expert guide to the best clinical management? If so, this is the book for you, providing a full analysis of pituitary disorder management from acromegaly to Addison's Disease; from Cushing's Disease to hypopituitarism; from hormone disorders to hormone replacement. 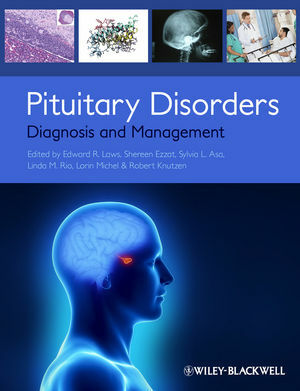 Pituitary Disorders: Diagnosis and Management is the perfect clinical tool for physicians and health care providers from many related disciplines, and an essential companion for the best quality management of pituitary patients. Sylvia Asa, MD, PhD, Clinical Department Head, Department of Laboratory Medicine and Pathobiology, University of Toronto, University Health Network and Ontario Cancer Institute, Toronto, Canada. Edward R. Laws, MD, FACS, Director, Pituitary/Neuroendocrine Center, Department of Neurosurgery, Brigham & Women's Hospital, Harvard University, Boston, Massachusetts, USA. Shereen Ezzat, FACO, FRCPC, MD, Professor of Medicine & Oncology Head, Endocrine Oncology Site Group, Princess Margaret Hospital, Ontario Cancer Institute, University Health Network, Toronto, Ontario, Canada. Linda Rio, MA, MFT, Pituitary Network Association, Los Angeles, California, USA. T. Brooks Vaughan III, Kristen Owen Riley, and Lewis S. Blevins Jr.
Gautam U. Mehta and John A. Jane Jr.